As the saying goes, one should judge a person by the company they keep. I’d never heard of Per Mathisen’s music before receiving this CD to review. However, given the musicians with whom this Norwegian “bass viking” has collaborated since 1994, I had a sense I’d like his playing before I even listened to it. I was right. 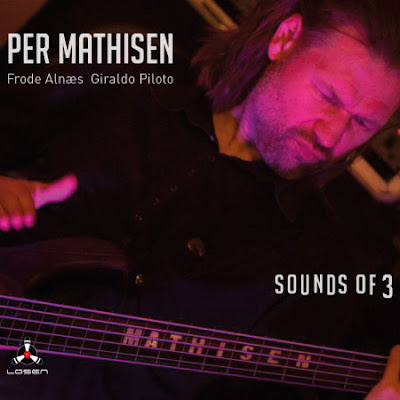 Gary Husband, sax player Bill Evans, guitarist Mike Stern, drummers Bill Bruford and Terri Lynne Carrington are just some of the contemporary jazz luminaries who have turned to Mathisen to provide low-end energy to their recordings and live shows, and this new trio album shows why. The bassist is regarded as Norway’s answer to Jaco Pastorius or, when playing upright, Niels Henning Ørsted Pedersen, and the evident dexterity and brio in his playing identifies why such comparisons are well-deserved. On this album he’s joined by Frode Alnaes on guitars and Giraldo Piloto, one of Cuba’s most acclaimed drummers. Together, they play eight original Mathisen compositions which cover a wide range of musical dynamics, from pulsing jazz-rock to funk and blues, each style melding into the each other to create an overall sound that eradicates the borders between styles. As a reference point, the sound Mathisen comes closest to is fellow Nordic bassist, Swede Jonas Hellborg, once of John McLaughlin’s band. On listening to tracks like Rabbagast II the comparison is uncanny: mournful but expressive guitars, propulsive jazz-rock beats and a treble-rich, percussive bass sound which owns the melody and rhythm roles equally. But Mathisen's no simple Hellborg clone. Through all the tracks there’s a strong improvisational element, not just in the solos but across each composition, and each instrumentalist has a chance to shine - this is definitely a trio album, not just Mathisen and two guns for hire. Alnaes’ capacity to pick out surprising chord progressions and inversions that really prick up the ears is key to the album’s sound (bringing to mind, funnily enough, rock guitarist Steve Morse’s blues-y sound as the closest facsimile). Piloto’s drumming is filled with gusto, but never to the extend of dominating the sound. There’s plenty across the eight tracks on the album to enjoy. Standout cuts include Kick Ab shuffle, with its Moog-ish prelude that ascends into a gritty, toe-tappingly catch blues jazz trip, and Rumblemania, on which Mathisen lets loose his inner Marcus Miller but keeps things restrained, using the percussive explosions of his slap and pop to counterpoint some lovely finger-style playing. Overall, this is an enjoyable album. While not particularly innovative or ground-breaking - a couple of tracks, such as Travelling Man, seem a little under-powered - it’s nevertheless worth checking out if you enjoy high-voltage, low-range sounds and strong collective playing.